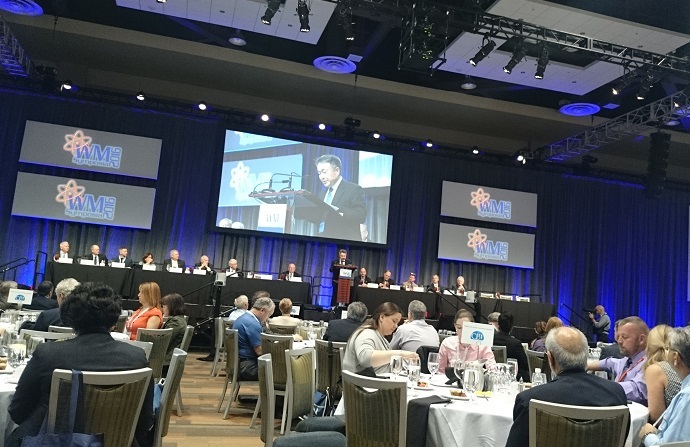 My congratulations to Luke Boast, who’s just received a special award part-way through the Waste Management 2016 (WM2016) conference in Phoenix, Arizona. This annual US event is focused on radioactive waste management and attracts thousands of delegates each year. Luke was presented with the ‘UK featured Nation’ award, which reflects the fact that the UK is the highlighted country for 2016. He’s based at Sheffield University and is currently on secondment to the Central Laboratory at Sellafield, working with NNL and Kurion, researching the thermal treatment of plutonium-contaminated material. Luke’s work is one of many PhD projects funded or co-funded through our R&D budget. I’m also pleased to report that another of our students, Stephanie Thornber, was sponsored to attend WM2016 in Phoenix which runs from 6-10 March. Stephanie, who’s also at Sheffield University, previously won Best Oral Presentation at the DISTINCTIVE conference. The DISTINCTIVE research consortium, supported by the NDA and several of our research partners, is led by Leeds University along with a number of other UK universities. Luke and Stephanie are among six UK-based postgraduates who were awarded scholarships so they can attend Phoenix. The six were among a group of 22 from all over the world who received a $5,000 Roy G Post Foundation scholarship. They share links to the NDA via our R&D investments, through their academic supervisors or through the nucleargraduates training programme. Dr Roy G Post founded the annual Waste Management Conference, which looks in detail at cost-effective, environmentally responsible solutions to the safe management of radioactive waste and radioactive materials. For the postgrads, it’s a fantastic opportunity to share their research, find out what others are doing in the same field, to network with delegates who will include suppliers, academics, plant operators and others. Who knows, future career opportunities may also open up for them. 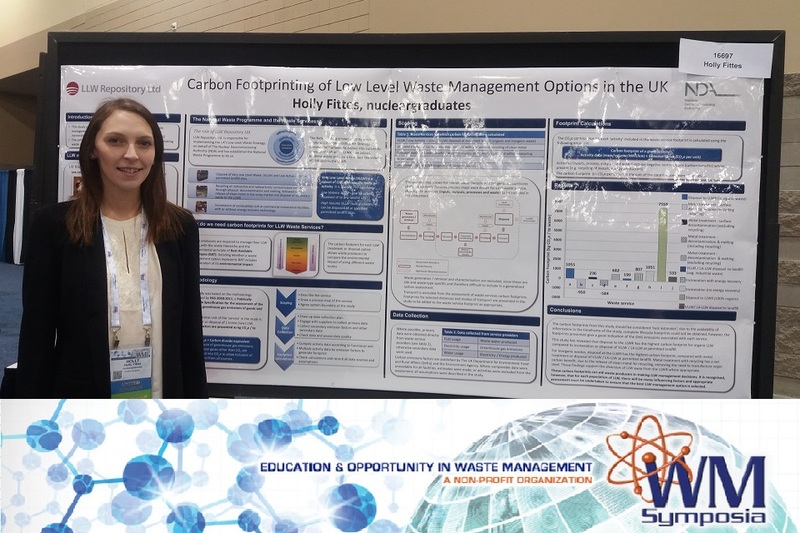 Also at WM2016 is Holly Fittes, an environmental scientist who is the first member of the nucleargraduates scheme to be sponsored by the Low Level Waste Repository Ltd. After 8 months at LLWR, Holly moved to Sellafield is now with an engineering consultancy. Holly and Hannah are both presenting posters at Phoenix. "I'm really enjoying the conference so far, I attended a very interesting panel session on Hot Topics in US DoE Environmental Management. I also enjoyed presenting my poster and discussing it with several people who were interested." With our country as the focus this year, there are a number of UK exhibition stands in the main hall, a presentation by our Chief Executive John Clarke, as well as related technical discussions and poster sessions, all based on UK topics. In addition to NDA representation, NDA subsidiaries and suppliers are also attending.